JTI: Winston, Camel | Corporate Events | Brands in Action | Direct Marketing S.A. Customer relationship management (CRM) is one of the most efficient approaches to create and maintain lasting relationships with customers. 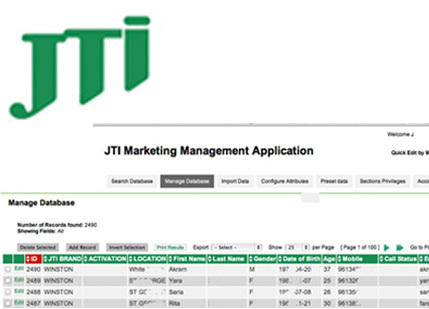 In anticipation of Lebanon’s tobacco control law, JTI turned to us in 2010 to create a user-friendly CRM system. Coming into effect in 2012, the law introduced a comprehensive ban on tobacco advertising, promotion and sponsorship. Based on JTI’s marketing needs, we developed the software from scratch, carefully compiling each individual record to facilitate filtering. We update the database periodically to enable JTI to keep interacting with their consumers and market their products to them. With the CRM system, JTI is able to gain an insight into the behavior of their consumers and modify their business operations to ensure that their consumers are served in the best possible way. The company’s already used the system for direct mail campaigns, which it asked us to handle as well. We’ve distributed personalized sample packs and promo items to selected targets drawn from the database.